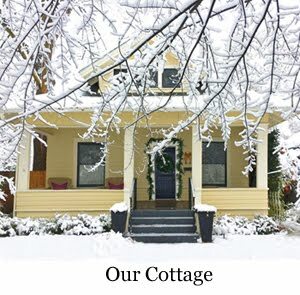 Blogland was full of beautiful spring inspiration this week. 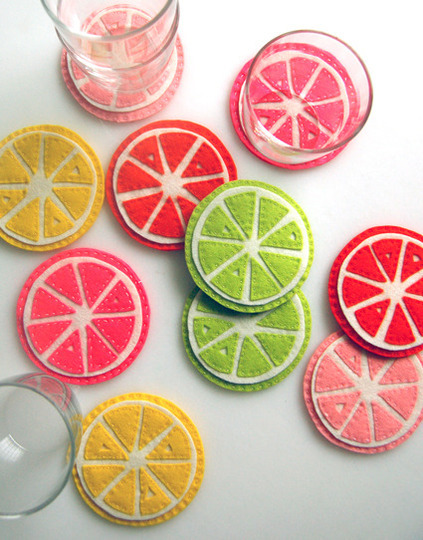 Fruit slice coasters made from felt in bright summer colors are just the thing for my deck table. I think I'll store mine in a pretty tin with a tight fitting lid so I can leave them outside right on the table. The Purl Bee has the tutorial to sew these little cuties. 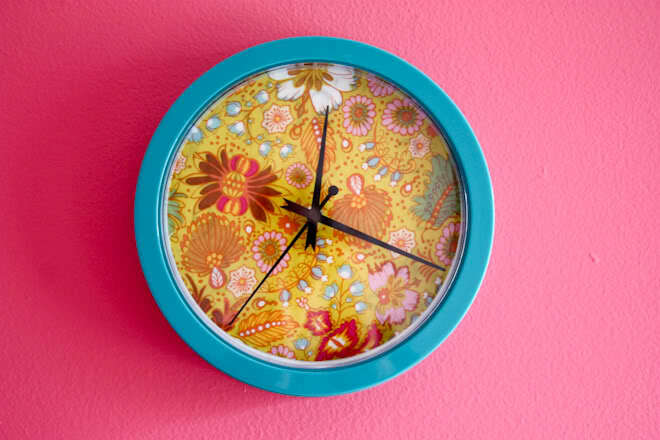 I have a ho-hum plain white plastic clock that doesn't do much for my room other than tell the time. It won't be ho-hum for long once I line it with colorful fabric like Raechel has done in this tutorial from Finding My Feet. 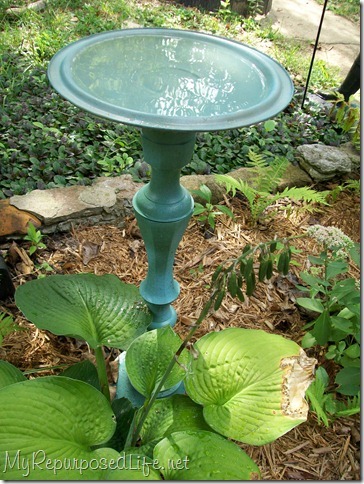 Gail at My Repurposed Life made this birdbath from an extra large candlestick and a pot lid. So creative, and I love the color! 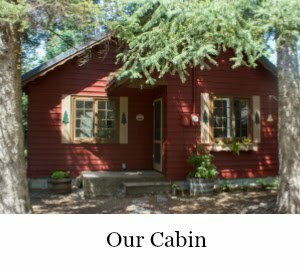 You can probably tell I have the outdoors on my mind as I think of future summer dinners out on the deck. 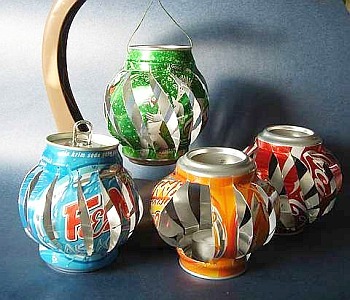 These recycled soda can lanterns from The Star Online will add color and sparkle by day hanging in a dark shady corner of my yard under my maple tree and sparkly light at night when the candles are lit. 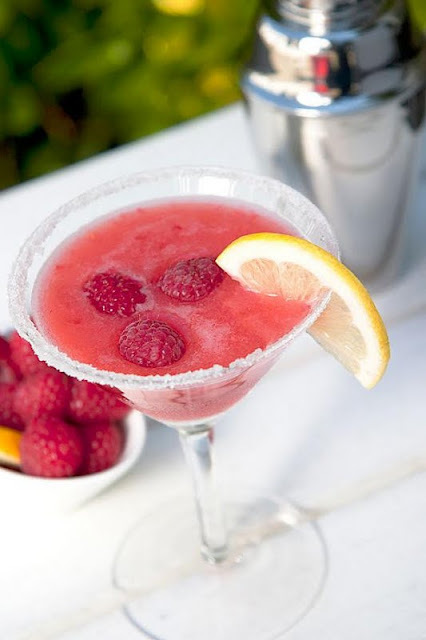 Lemon Drops are one of my favorite martinis, and when I saw this Raspberry Lemon Drop recipe at Nugget Markets I knew I had to add it to my summer drinks recipe file. Oh yum! 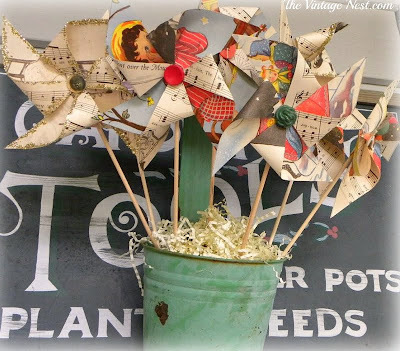 Lynn, at The Vintage Nest, left a super nice comment on my Paper Pinwheels post this week that led me back to her blog and these sweet pinwheels she offers in her booth. (I'm going to borrow her idea for using cute buttons in the center.) Wouldn't these make a great Mother's Day bouquet? And speaking of cute buttons, The Button Floozies have made some adorable button tags. They'd be perfect tied onto a spring package or as gifts on their own. Thanks so much for stopping by today, and I hope you have a great weekend. Great ideas to inspire! I really like the fruit slice coasters. They really say summer! Thanks for sharing today! What a wonderful inspiring collection. I love the bird bath. Your inspirations have gotten me inspired to bring out some color around my house. Thanks for sharing. Adding you to my follow list. Have a great weekend. Those coasters are so cool! And, those drinks look amazing! Thanks for the link love! Great pics! I can't believe how cute those coasters are! 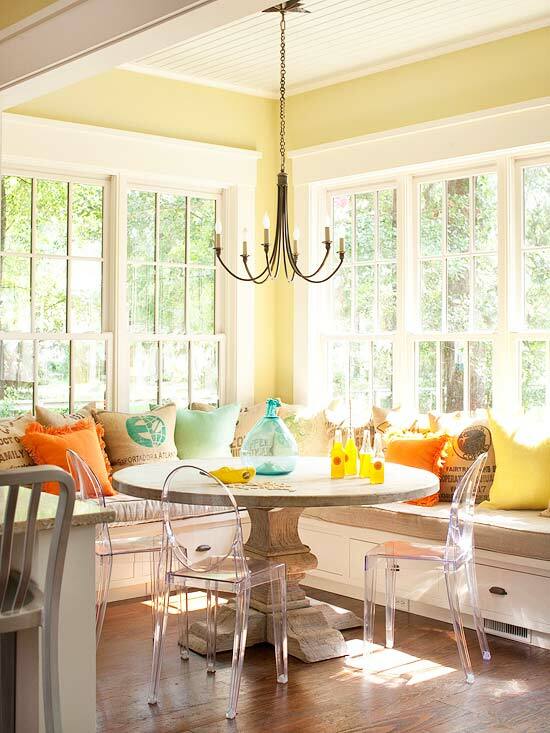 Love the banquette, love the bird bath, and the pinwheels are sublime! I just might have to try on your idea here shortly. They look so pert and pretty in their floral bucket. Adorable! And Thank You for posting such a thoughtful, sweet comment over at PPS. I loved those pinwheels when I saw them on her blog! Awesome idea! Thanks for all the inspiration this week. what fun FINDS!!!!! but i have to say -- with the week i had -- that lemon drop cocktail is looking mighty tasty!!!! : ) thanks for sharing all these wonderful finds with us! sending hugs to you and yours! Man - would someone tell western PA it's spring? Freezing rain and gray dreary skies today. These are all so happy and cheerful and warm me up! I just love Gail's DIY bird bath! Hope you're having a fabulous weekend (with sunshine!). The birdbath is wonderful and the clock tutorial exactly what i was looking for. Thank you for sharing. Sweet! I'm glad you liked the tags on Button Floozies! You put together a fun collection there. 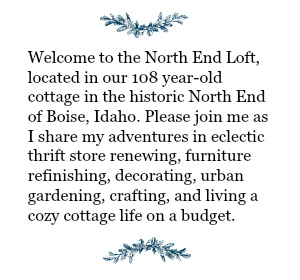 And I really like your ruffled stool on your more recent post, too!